When I first dipped my toes into the world of tabletop gaming, I was filled to the brim with conflicting emotions. While the giddiness of having stumbled upon something new and wonderful usually took the spotlight, there was, for a long time, also a persistent undercurrent of fear and doubt that couldn’t be ignored no matter how hard I tried. And so, ever the champion of the path of least resistance, I sincerely considered backing away from the hobby to salvage my tender self-worth via preventative measure. I’d probably have succeeded had I not been working at game conventions as part of my job at the time. It was purely thanks to being in the right place at the right time that I first encountered the mighty force that is the FLGS, which completely up-ended my attempts to back away with my tail between my legs. The confidence it took to use that word, “gamer”, to describe myself can be wholly attributed to my having met people who either own or work at these incredible stores. Through visiting several across the country, I not only gained a better understanding of the hobby at large, but also of the types of amazing and passionate people who have chosen to make a career out of being a hobby ambassador. Whether I was being introduced to new games to help me discover what I did or didn’t enjoy in my play experience, seeing and touching hands-on demos set up throughout the floor, or attending after-hours events that introduced me to people I truly enjoy being around, the FLGS experience was the missing piece that I’d felt the absence of when first entering the hobby. Devoted FLGS employee Jacinda teaches a group of three how to play one of our favorite games: King of Tokyo! 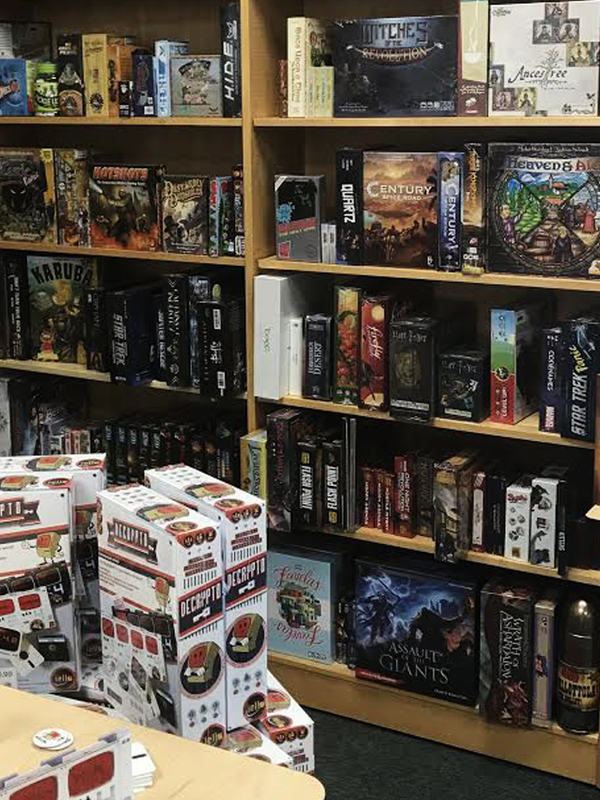 I recently reflected upon my personal experience with the General Manager of Total Escape Games in Broomfield, Colorado, John Stephens, and he acknowledged knowingly how overwhelming it can be for new customers to enter his store, let alone the hobby in general. When I picked his brain as to how he combats the obstacles that new gamers face, he explained that finding out WHY someone enters his space is key, since it serves not only to gauge their experiences thus far (and potentially apologize/rectify them), but also sets expectations of how to best serve them moving forward. While I understand that this all sounds perfectly reasonable and simple in theory, consider the last time you went shopping and were either harassed by pushy salespeople or worse- completely ignored when you wanted nothing more than someone to assist you. The defining characteristic of employees at an FLGS is that they love to play. They understand the products and the culture of gaming, and because they value it so, they sincerely strive to share it with the rest of the world. John interacts with every member of his seven-person team on a weekly basis, ensuring that they understand how to play and teach new games being carried in-store. This greatly increases the likelihood that every single customer walking in the door will have a positive experience, since they are probably going to leave knowing something they didn’t when they arrived. What is it about this hobby that motivates people to be knowledge-hungry and crave the experience of gaming? He’s right, obviously. As I considered his sentiment, it really struck a chord with me. Most people I know, myself included, are exhausted by the amount of work, negativity, and responsibility weighing down our lives. Gaming fills a void that many aren’t able to articulate before experiencing something that counter-acts it, and I really do believe that this “missing piece” phenomenon explains the surge in popularity of tabletop gaming over the last few years. A small sample of the product offerings in store at Total Escape Games in Broomfield, Colorado. As I eyed photographs of Total Escape that John shared with me, marveling at the nearly thousand different games available to purchase, I asked John how he decides what titles to bring in store. With more than 3,000 new games a year being released into the market, he admits that picking what to sell can be a real challenge. A huge chunk of his time is spent doing research online and in gaming magazines, consulting with a network of other store owners across the country, and frequently traveling to conventions and trade shows to physically see and test new games coming soon. In fact, all his travel totaled up currently has him away from the store for nearly four months out of the year! In addition to the robust play space available at his store (which can seat up to 70 people and which boasts an impressive schedule of events – one for every single night of the week! ), John also brings games to people in the outside world to boost awareness of the hobby. At a local Gifted & Talented school, he hosts Magic: The Gathering Tournaments, and teaches game design classes to those eager to create projects of their own. He told me, “If you can teach a kid to play games, you’re training the next generation of gamers. They’ll train others for you!” This description of the snowball effect resonated with me, and I chuckled thinking about how much of a gaming advocate I’ve morphed into since I was at first too afraid to even ask to sit down at a table with someone I didn’t know. To combat the chance of customers feeling unwelcome, Total Escape employs a strict inclusivity policy. His customers range in age from children to senior citizens, and when I asked about the participants at events, he beamed describing the diverse groups he gets in store, squashing the image media has painted in our heads of the type of people expected to hang out playing D&D in a dingy basement. “Every time we allow messaging or an experience that isn’t inclusive, we don’t only hurt our own store – we hurt the hobby.” He went on, “Every time we live up to the stereotype of the ‘unwashed nerd’, we fail.” This message, this mission, is that of an FLGS that is going to ensure that people like me return for more. In the span of a couple of years, my tabletop journey has oscillated between the rush of discovering something new and wonderful to the crushing anxiety of feeling like an ill-prepared imposter, to finally finding a space where I felt welcome, supported, and even empowered. The discovery of the resource that is the Friendly Local Game Store has allowed me to experience tabletop gaming in a way that reassured me that I did, in fact, have a place in this hobby, and that even I can escape reality whenever I choose.